Happy new SIMPLE recipe Tuesday! This sesame snow pea salad was inspired by a salad bar dish I repeatedly got while life got busy, and now I’m making it at home for a healthier homemade option. Plus, it’s the perfect picnic friendly salad that doesn’t require chilling. It’s refreshing, crunchy, contains healthy fats, fiber, protein, and minerals, and did I mention it’s delicious? Read more for the recipe! As much as my boyfriend Jesse and I love cooking at home together, it’s really nice to be able to have a couple healthy take outs spots on our radar for a quick, healthy, and delicious meal at home. These past several months have been full of moving, growing work, travel, and still maintaining our social life! All that to say, we reached for the Whole Foods salad bar more times than we can count on one hand the past month. I had this amazing sesame pea salad and was inspired to share my own version with you guys for a quick side dish. Snow peas, not to be confused with snap peas a.k.a. sugar snap peas, are flat and typically used in stir-fry dishes. They can be eaten whole (including those sometimes pesky strings) or steamed and have a subtle sweet flavor. Sugar snap peas are juicy since they’re larger and contain more water. The peas inside the pod are also used like your standard “green pea” from the garden pea that’s used in cooking. It’s ideal to take off the string on snap peas since it can become very chewy and unpleasant to eat. The snow peas in this recipe are effortless to use and prep and taste amazing with the sesame oil and seeds. Fiber town! 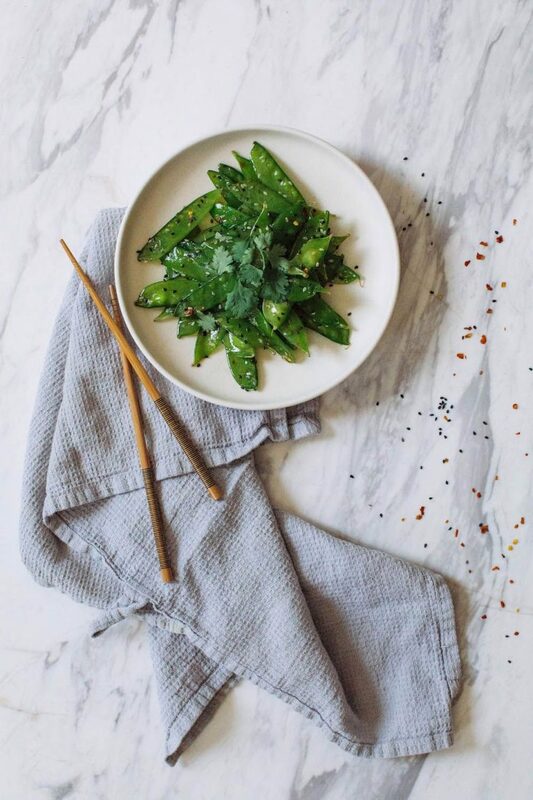 Just 1 cup of snow peas contains about 4g of fiber, which is pretty good for just a side dish and in the grand scheme of your day, it’s about 8% of your daily needs of fiber (based on 35g / day which is “standard”, some folks need more, some need less). Healthy fat: in about 1/4 cup of sesame seeds, used in the entire recipe, there’s about 14g fat including both poly and monounsaturated fats. Minerals galore: from copper, calcium, iron, manganese, zinc, phosphorus, molybdenum, selenium, to select B vitamins. Sesame seeds are a great “bone health” food with this mineral makeup. Protein: surprisingly peas contain some plant based protein! In fact, 1 cup of snow peas contains about 3 grams of protein which is an added bonus for a side dish or snack. Optimizer Option: to make this a meal, try adding a protein of your choice (i.e. tofu, chicken, fish, tempeh, hemp seeds), healthy fats, and a carbohydrate (try rice with this one!). We love to make this on the weekend during batch cooking day, and it makes for a refreshing and super delicious salad, side dish, or entree when adding the optimizer options above. Since it’s summer, we’re in summer party and picnic mode so this is a great dish to share with friends – plus it doesn’t require chilling so you can enjoy it warm or cold! If you try this recipe, I wanna hear about it, so let’s chat! Leave a comment, rate it (this helps me improve future recipes), and don’t forget to tag a picture with #nutritionstripped to show how you live and try these recipes on Instagram! I’d love to see what you come up with. Onward to the kitchen! A refreshing spring salad using crunchy snow peas, sesame seeds and oil for a simple healthy recipe or side dish. In a medium size mixing bowl, combine all ingredients and toss to coat the snow peas in the oil and sesame seeds. Adjust seasonings to taste. Serve at room temperature or chilled, in an airtight glass container for up to 1 week.